We’ve already walked you through the most essential programming principles 10 Basic Programming Principles Every Programmer Must Follow 10 Basic Programming Principles Every Programmer Must Follow Always write code that can be maintained by anyone who may end up working on your software. To that end, here are several programming principles to help you clean up your act. Read More you need to know about, but there’s another class of programming principles that may prove even more beneficial than those. Whereas the aforementioned principles teach you how to be smart with your code, the following principles will teach you to be wise with your code. Some of them are strange, and many of them are humorous, but they’re all equally practical and important. Take heed! It’s talking about the tendency of programs to attract more and more features over time and inevitably drift towards increasing complexity. You may know this as feature creep, which is the ongoing addition of new features that have nothing to do with the main purpose of the program. Feature creep leads to bloat, and bloat is often undesirable. Back in the 90s, hard drives and CPUs and RAM were far more restrictive than they are today and programmers worked hard to fit as much as they could within the limits. Yet now that we have bigger drives and faster CPUs and more RAM, we still struggle to respect limits. Everything gets bloated over time. It’s your job to keep that in check. In other words, it’s wise to figure out the one problem your software aims to solve and then be very good at that one thing. Keep it simple. The more you spread yourself thin, the more unmanageable the project will become, and the more undesirable it becomes for users. It comes from the broader Peter Principle, which states that when employees are promoted based on their current competency and not their expected competency at their next position, all employees eventually end up in a position of incompetence. Take that principle and apply it to software, and you’ll see why worse software can often be better. This seemingly demotivational saying is actually something to embrace. The fact is, nobody is perfect. You might think you’re a genius programmer right now, but there’s always something more you can learn, always more room to grow. If you ever look back on old code and cringe, it probably means you’ve learned something new since then. Put another way: if you look back on an old project and you can’t see anything you can improve or would do differently next time around, you’ve likely stagnated as a programmer. First published in the IBM Systems Journal back in 1984, this principle is still surprisingly relevant today — perhaps more so than ever before. It essentially touches on the delicate balance between innovation and familiarity: if a piece of software is too different from others of its kind and doesn’t conform to user expectations, then they likely won’t adopt it. It’s better to strive for incremental improvements that are just big enough to be impressive but small enough to stay familiar. Often called Lubarsky’s Law of Cybernetic Entomology, it’s unclear who this Lubarsky actually is. However, his principle rings true for all programmers: no matter how cleanly you write your code, no matter how robustly you test your modules, no matter how often you refactor your classes, there will always be another bug. In a way, this is a freeing principle. While we should definitely strive for bug-free code, it’s also important to remember that perfectionism is the enemy of good. Look for bugs, fix them when they arise, and then move on. Brian Kernighan, the very same one who co-authored the C programming language bible Why C Programming Is Still Worth Learning Why C Programming Is Still Worth Learning C is not a dead language. In fact, IEEE Spectrum magazine ranked it as the No. 2 top language in 2017. Here are five reasons why. Read More , is famous for this insightful law. The crux of it is this: write good code, write readable code, write simple code, anything as long as it’s not clever code. Trying to flex your programming muscles with ivory tower complexity is the exact opposite of what it means to write clean and better code 10 Tips for Writing Cleaner & Better Code 10 Tips for Writing Cleaner & Better Code Writing clean code looks easier than it actually is, but the benefits are worth it. Here's how you can start writing cleaner code today. Read More . The harder your code is to understand, the harder it will be to debug when it inevitably breaks. This one isn’t so much a principle as it is a technique, but it’s so helpful and strange that we’d be remiss to leave it out. First told in The Pragmatic Programmer, rubber duck debugging is when you debug broken software by explaining your code to an inanimate object (e.g. a rubber duck) one line at a time. It works because the act of explanation triggers different parts of your brain, and you’re more likely to spot inconsistencies and figure out where you went wrong. 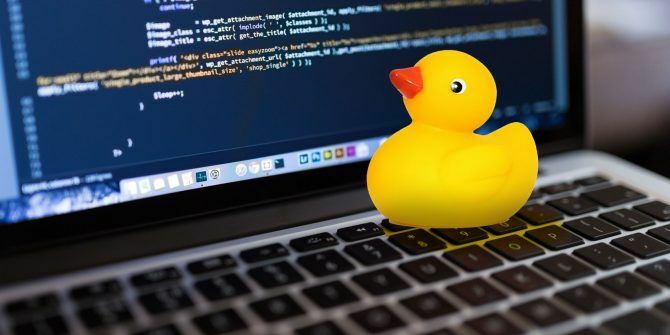 For this reason, a rubber duck can be a surprisingly nifty gift for programmers The Best Geek Gifts for Programmers: 20 Ideas for Coders and Nerds The Best Geek Gifts for Programmers: 20 Ideas for Coders and Nerds Looking for a gift for a programmer? Here are the best geek gifts, ranging from mechanical keyboards to standing desks and more. Read More , whether you buy it for yourself or for a programming buddy of yours. This cheeky little proverb by Tom Cargill gets at the heart of why programming can be so frustrating: no matter how close you think you are to being finished, you’re much farther away than even your best estimations. When you think you’re done, you’re only halfway there. This one principle, coined by Cyril Northcote Parkinson, is a broader principle that absolutely applies to programming and goes hand in hand with the Ninety-Ninety Rule above: however much time you have to finish a project is exactly how long it’s going to take. In software development, “finishing early” is pretty much a myth. Parkinson’s Law is the reason why proper deadlines are crucial if you want to finish and ship your software. That’s why modern professional programmers often recommend agile project management principles How to Use Agile Project Management Principles to Organize Your Life How to Use Agile Project Management Principles to Organize Your Life Agile, best known as a project management method, is a great framework for managing your personal life. We'll show you which principles you can borrow -- free worksheet download included! Read More and project management tools like Asana Trello vs. Asana: The Best Free Project Management Tool Is... Trello vs. Asana: The Best Free Project Management Tool Is... Choosing between Trello and Asana is difficult. Here we compare the free plans and help you decide which project management tool is best for your team. Read More . The next time you’re late on a project, which is likely since most programming projects need more time than allotted, remember that adding coders won’t solve it any faster. In fact, it’ll probably take longer to complete. Not only do you need to bring the new coder(s) up to speed, they’ll likely clash with the existing coders. More things will need to be documented, more bureaucracy will be needed to keep everyone on the same page, and more friction will come out of the whole crunch-time experience. Now that you know these principles, you’re actually better suited for the real world of programming, not just what you’ve encountered in school, in a web course, or in a bootcamp. These principles come from years and years of experience and failures. With this newfound wisdom, you can now set forth to a high-demand programming career 10 Computer Programming Jobs That Are In Demand Right Now 10 Computer Programming Jobs That Are In Demand Right Now Since landing a programming job can be tough in the current landscape, consider focusing on one of the following concentrations to improve your chances of success. Read More with more realistic expectations. For that, learn how to maximize your programming career opportunities How To Improve Your Programming Career Opportunities How To Improve Your Programming Career Opportunities If you're hoping to start, restart, or otherwise improve your programming career, it isn't easy. If you are in college, the time is now. Here are some tips that can take you far. Read More . And if you decide that programming isn’t for you, don’t fret — consider one of these non-coding tech jobs instead Coding Isn't For Everyone: 7 Tech Jobs You Can Get Without It Coding Isn't For Everyone: 7 Tech Jobs You Can Get Without It Don't be discouraged if you want to be a part of the tech field -- there are plenty of jobs for people who don't know how to code! Read More . Which of these principles ring truest to you? Know of any other weird programming principles that we missed? Let us know down in the comments below! My old project manager said that bugs were merely undocumented features! Good collection. I'm particularly glad you went back to uncover Fred Brooks. Some of the writings from the 1960's and 1970's, like Brooks's "The Mythical Man-Month," are among the most useful and well-written articles on creating software systems. The rules haven't really changed since I started programming in 1984. It's still a tough job. LivingDeadChangePhobia Management fear of changing a system by persons now dead who learned to code on punch cards or on the job. LivingDeadPunchCardPhobiManagement Fear of changing a system designed by people who are dead and learned to program with punch cards. Outstanding article! I'll share it with the rest of planet Earth as soon as I'm done writing this comment. Once you've run into all of these, you can call yourself an experienced programmer. "Back in the 90s, hard drives and CPUs and RAM were far more restrictive"
The problem with small drives, little RAM and slow CPUs did not start in the 1990s and PC. It goes back to the ENIAC in the mid 1940s. It is this problem that was the main cause of the Y2K scare. To conserve storage space and computer memory, programmers kept on inventing novel ways of compressing dates in as few bytes as possible. Then before 2000 came along, all those cleverly formatted dates had to be uncompressed throwing every IT member into a tizzy. "5. Law of Cybernetic Entomology"
It is a given that users will find bugs in even the best tested and debugged software. There always is more users than developers. Also developers think rationally and logically when developing and testing software. Users have no such constraints. They abuse the software with impunity and abandon. If there were no bugs in any software then there would be no "hackers" I believe. A 83 year old "USER"
1. Every program can be reduced by one instruction or statement. 2. Every program has at least one bug. Therefore: Every program can be reduced to a single instruction that doesn't work. I always took this as a stab at programmers who spend way to much time on code optimization. "Every program has at least one bug." Does that mean you shouldn;t correct them until there are at least 2 bugs ? Only if you can squash them under the same boot stomp.